Situation Room: An Epiphany! Well I think it was one! An Epiphany! Well I think it was one! I've got an unusual title for this entry, more of that later. I thought I'd update progress on the terrain. The hills are now all done and I have enough material to do about another 40 of the things! Anyone short of good quality high density urethane? The first piccy shows the main ridge that will be used for games like Waterloo, Austerlitz etc. It is 4.5 metres long, 14 1/2 feet for old imperial guys like me. It is in 4 parts, the centre sections being somewhat heavy and all the joins within a section have been biscuited and glued. When the whole ridge is put together, biscuits are used to help keep the centre sections aligned. 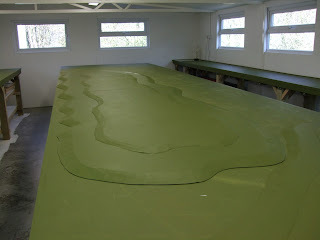 The main ridge is really a specialist piece and the typical large hills of which I have 2 are a more conservative 2.5 metres in length, about 7 1/2 feet. These hills would be good for a Bautzen type game. In addition, I have about 15 other hills that can be used individually or some can be used to make a third tier for either of the above. That's how the sunken road at Waterloo would be represented. All the hills and boards are simply painted. I then started to look at the texturing and dry brushing. I started with a small hill to see what it was like using masonry paint and fine sand (stuff used for goldfish bowls). The hills looked fine and I even tried a part of a large hill. Then I tried the main board on one side and it proved inordinately difficult. I couldn't get an even spread of the sand/paint mix and it looked really odd, even when dry brushed. So I needed to think on it and that same night I got out the first real Wargames book I ever read, The War Game by Charles Grant, 1971. And then the Epiphany (or madness as its a fine line between the two). 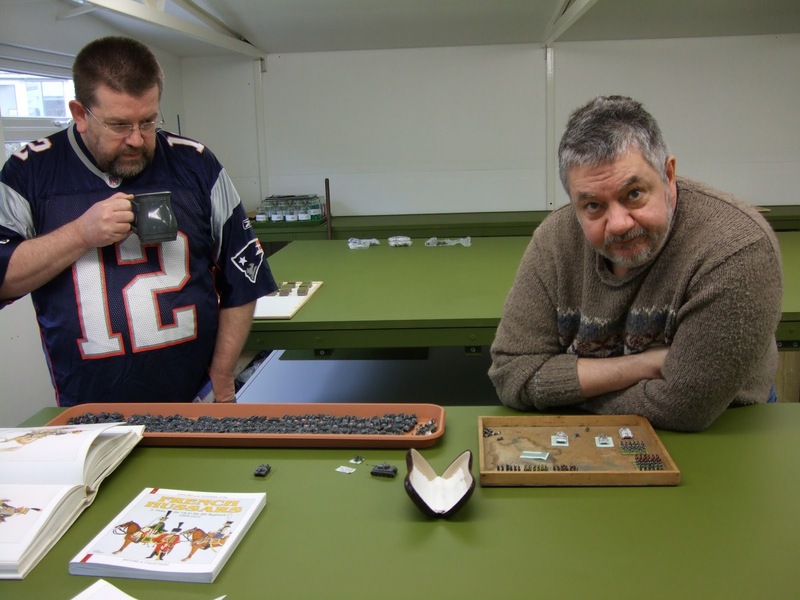 The Charles Grant book is an 18c battle and the terrain is very simple and simply painted, much to where I am now. The figures he used looked fine against such a background, clear bright colours and the fact that there was no texturing doesn't detract, if anything the opposite. Then I realised I hadn't taken all om painted figures and put them on a clear painted board with the hills. I know from my earlier days that 20mm WWII figures and kit "gets lost" in good textured terrain. 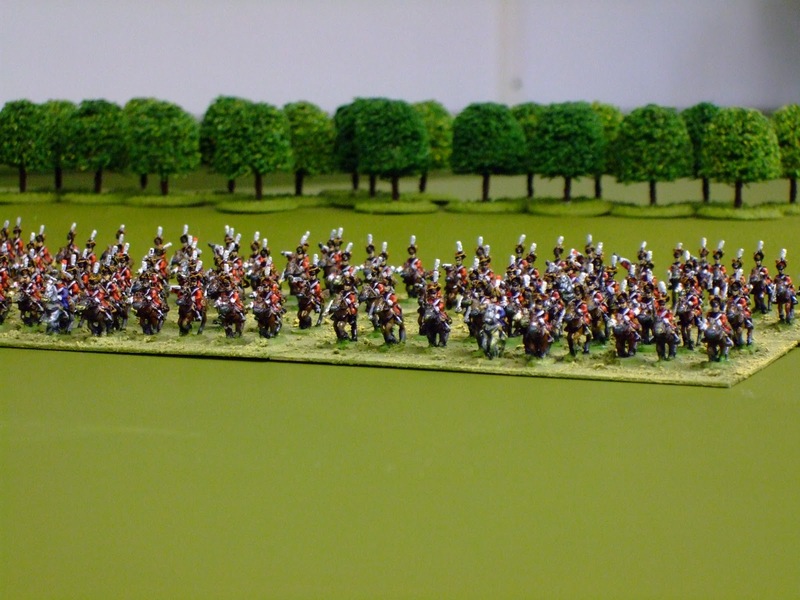 Moreover, 28mm Napoleonics work with textured terrain because of the size of the figures. So I tried the experiment of having the figures on textured bases, but on a plain coloured board. Its astonishing to me. I never realised that if I put the 10mm next to textured terrain, you begin to "lose" the figures "in the terrain". Put them on a plain board and the obvious change in contrast makes a humongous difference. A friend of mine, Neil, was coming with supplies of tanks and then I thought I'd ask him. ﻿The coffee is to recuperate Neil. Gobsmacked doesn't describe his initial thoughts! I'm just getting over his shock! He thinks its absolutely fantastic and I agree with him. The strategy is to now have the terrain a blank green, including hills and woods and keep the contrast to the figures, figure bases and some terrain like roads themselves and villages. What do the figures look like? Well, we are still learning with the camera, but this gives you a flavour. The Dutch Lancers of the Guard, 178 figures, easily picking out all the colours and detail, like grey horses for the trumpeters, the standard bearer, Colonel, plumes and even the cross on top of the Czapska. Next is more terrain and WWII tanks. You are absolutely right the figures look great on the smooth green with textured bases. 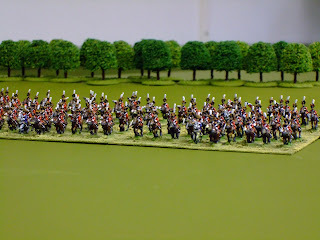 Si Bargery referred me to your blog - I'm very slowly working through some Redline Napoleonics for myself. Astonishing setup, as I suspect you already know. 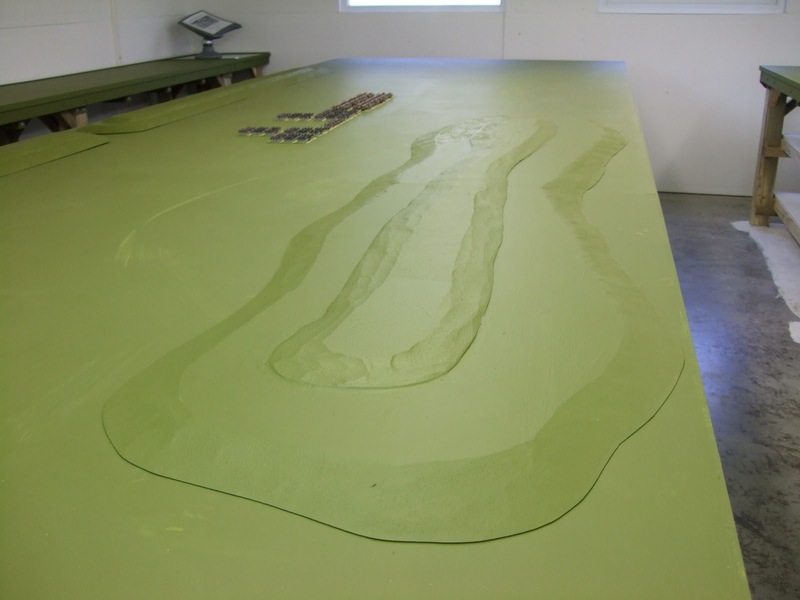 The smooth board with textured figure bases - looks absolutely spot on, which really surprises me. Perhaps we're all a bit too conditioned to expect/want all the terrain to be of an equal standard to the bases?